FILE - Hungarian Foreign Minister Peter Szijjarto is pictured at a news conference in Budapest, Feb. 22, 2018. Hungary's foreign minister is rejecting accusations his government is racist, but said it does not accept that a multicultural society is better than a homogeneous one. His comments came amid a rise in nationalist and anti-immigrant sentiment throughout parts of Europe. Syrian migrants shout slogans at a refugee camp in Roszke, Hungary, Aug. 28, 2015. Migration has been a key election issue in several recent European elections, and Hungary is no different. This Sunday, Hungarians will vote in general elections, and Orban and his right-wing Fidesz party are overwhelmingly favored to stay in power. Szijjártó is at the United Nations this week for negotiations on a Global Compact on Migration. In December, the United States pulled out of the discussions, saying the proposed pact was not consistent with Trump administration immigration policies. But despite its objections, Szijjártó said Hungary would remain in the migration negotiations and seek changes to the document. Hungarian Prime Minister Viktor Orban speaks at a campaign event in Budapest, Hungary, June 27, 2017. The U.N. discussions are part of a process to draft a multilateral agreement that would cover all aspects of safe, orderly and regular migration. The United Nations estimates there are about 244 million migrants in the world, or just over 3 percent of the world's population. Hungary’s location at the crossroads of two popular migration routes brought it more than 440,000 mostly Syrian and Afghan refugees and migrants in 2015, according to the International Organization for Migration (IOM). 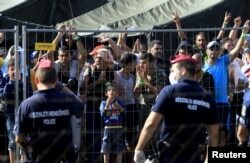 Most were passing through to reach other European Union countries, but the massive influx was seen as disruptive and unwelcome by the Hungarian government. Hungary has since constructed fences along its southern border and enacted legislation that has significantly reduced irregular migration across its territory. The foreign minister told VOA that Hungarians do have a fundamental human right to live in safe conditions in their own country and that security comes first. “We will never accept that anyone gives priority to the questionable rights of migrants against the right of the Hungarian people to have a safe life back in Hungary,” he said.